I'm a huge William Castle fan so to see Joan Crawford in a Castle film is unmissable. Crawford plays the lead character, but she wasn't actually the first choice. Joan Blondell was originally set to play the title role but because of an accident she was replaced, Crawford demanded a-lot though. Crawford required the script be completely rewritten to her specifications before she agreed to sign on to the film, she also had final script and cast approval. 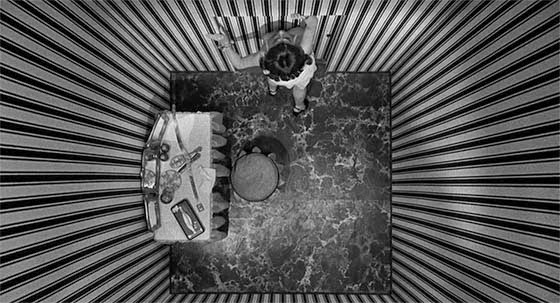 She added Mitchell Cox to the cast even though he was not an actor but was actually the vice-president of the Pepsi-Cola Company, Crawford had made this arrangement without consulting with William Castle. Pepsi is also featured throughout the film, the product placement was written in Crawford's contract. It was all worth it though in my opinion as she does a brilliant job, as do the rest of the cast. Castle does his usual magic touches to bring us an amazing feature. He maybe known for schlock Horror but nobody did it better and films like this are proof of that. He never did the credit he thoroughly deserved, a great story teller. 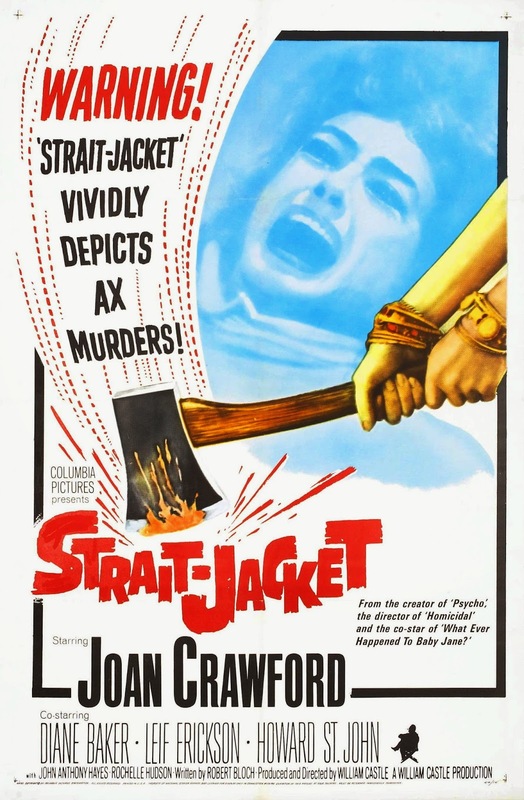 "Strait-Jacket" seems to have gotten lost in the shuffle over the years but make sure you give it a watch. Film debut of Lee Majors who got the small role of playing Lucy Harbin's (Joan Crawford's) husband in the flashback scene after his good friend Rock Hudson asked William Castle to please find a part for the then 23-year-old actor. 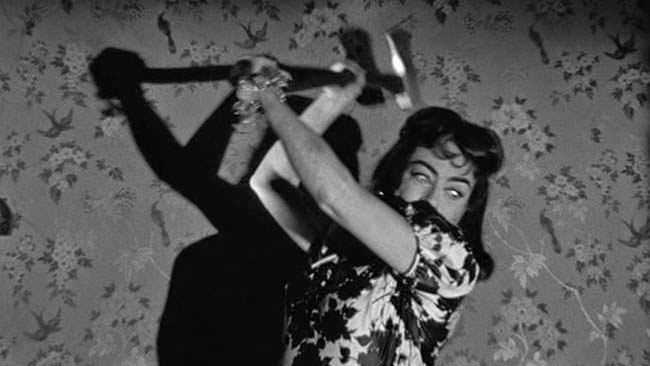 The children's rhyme chanted in the movie, "Lucy Harbin took an axe, gave her husband 40 whacks. When she saw what she had done, gave his girlfriend 41," is based on the famous rhyme about Lizzie Andrew Borden: "Lizzie Borden took an axe, gave her mother 40 whacks. When she saw what she had done, gave her father 41." 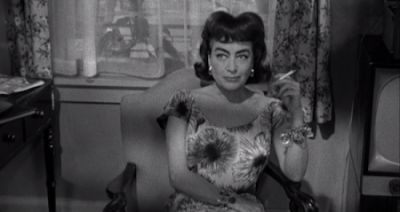 The sculpture of Joan Crawford used in the film was indeed real, created by Yucca Salamunich, a Yugoslav artist. The sculpture was originally presented to Crawford in 1941 on the set of A Woman's Face (1941). When Diane Baker was offered the role of Carol, replacing another actress, she had to begin shooting her scenes the next day. This film is listed among The 100 Most Enjoyably Bad Movies Ever Made in Golden Raspberry Award founder John Wilson's book THE OFFICIAL RAZZIE® MOVIE GUIDE. The sound effect for the heads being chopped off was the prop man wielding an axe and cutting a watermelon in half.